Istros drachma, V-th century B.C. The ancient Greek silver coin from Istros (Histria) pictured above are present on Romanian coins through the kind permission of Mr. Bogdan Costin. 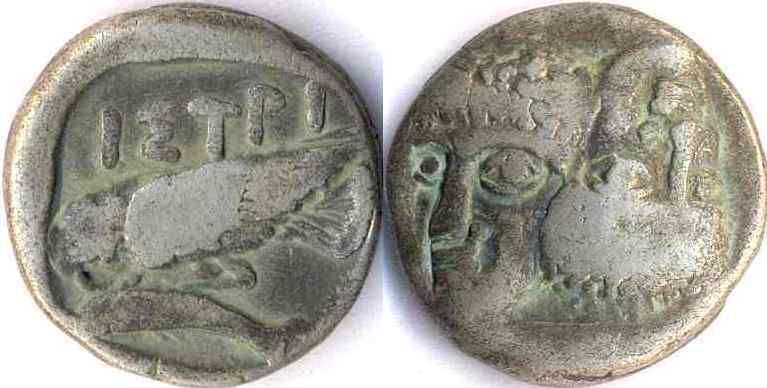 The coin is very old, the proof being the incuse square inside wich the dolphin and the eagle are represented along the name of the city. The sunken square - quadratum incusum - is a characteristic element of the old Greek drachmae, as would be the case of the famous owl drachmae of Athens (symbol of goddess Athena). The two joined heads on the obverse belong either to the Dioscuri or to other protective gods. On the coin shown the head to the right of the beholder is placed normally, the other upside down. There are also Istrian coins with the other possible placement of the heads. Silver Histrian drachmae circulated over the entire area of the later Dobrogea, having been found also in Muntenia and Moldavia. Other values apart from one drachma (weighing 7-8 grams in the 5th century and 5-6 in the 4th century BC) were also stricken. The images above picture a half drachma. There exist also drachma quarters, oboli (1 obolus = 1/6 drahma), hemioboli (1 hemiobolus = 1/2 obolus = 1/12 drahma) and even less valuable divisionary coins.